Each bulb produces 3 to 4 flower stems each of which produces 3 to 5 star-to bell-shaped nodding little flowers. They are one of the best for naturalizing. Plant them in large drifts along pathways where they can be easily viewed or let them self-seed in lawns or wooded areas. Scilla Siberica combines nicely with 'Glory-of-the-snow' (Chionodoxa) which flowers a bit earlier. In borders, rock gardens, lawns or wooded areas. (Besides the species itself); 'Alba' (white) and 'Spring Beauty' (dark blue). Native to the central plains of Russia. 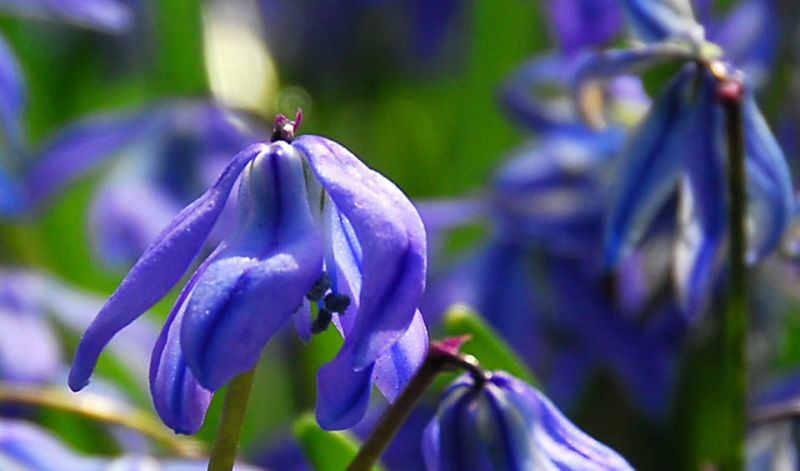 Certain species are now classified under 'Hyacinthoides'.